Continuous steam output non-stick coating self clean function ptfe sole plate vertical steam function, product power: 1200 watts; operating voltage: 220 – 240 volts includes: steam iron. A veteran in Indian market, Maharaja Whiteline has been an integral part of Indian households since 1976. It has a significant market presence with the largest range in industry across kitchen appliances, home comfort and garment care products. Maharaja is an established and one of the leader in mixer grinder, juicer mixer grinder, food processor, air cooler and room heater segment ensuring comfort in its full capacity. Pristine steam iron is an efficient ironing machine for removing wrinkles from clothes. All it will take is just a few minutes to revamp your clothes with its 1300w output. This steam iron has a tank capacity of 150ml, so you can iron a number clothes without the hassles of refilling it frequently. There is an adjustable control knob that enables you to set the temperature as per specific requirement of the clothes. Pristine has swivel cord and ergonomic handle that enhances the overall convenience of using this iron. Apart from these smart features, 40gm steam boost lets you target specific, stubborn areas. It also has vertical steam output feature, so you can easily iron hanging clothes and curtains as well. 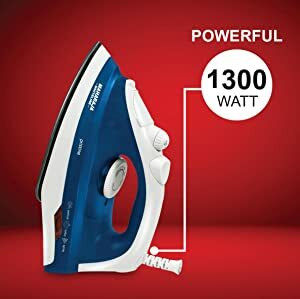 This iron is isI certified thus safe to be used in your home. Pristine steam iron is operable on 1300 W, which gets your job done in much less time. The lightweight iron is easy to work with and its ergonomic design makes the job much easier. 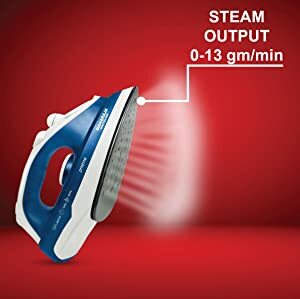 The efficiency of this steam iron relies on the brilliant cloud of steam that it lets out. 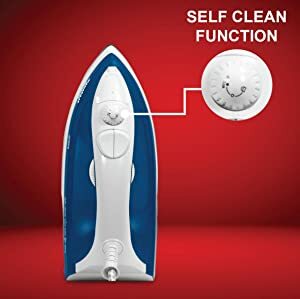 It has 40gm steam boost that lets you target stubborn areas and iron thick clothes as well. The powerful puff of steam makes your clothes wrinkle free in just one push. Pristine has a large tank capacity of 150ml and it is equipped with an easy to fill water input for added convenience. 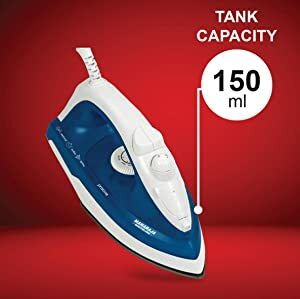 This big tank capacity allows you to iron a good number of clothes without the hassles of refilling it over and over. The 40gm steam boost allows you to easily iron thick clothes including cottons, linens and even upholstry. Just one push on the targetted area and what you get is creaseless fabric. 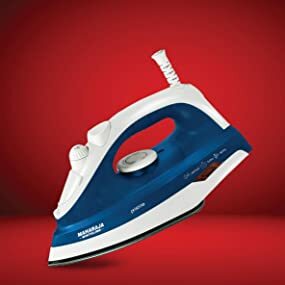 The Pristine steam iron by Maharaja embodies in itself the unique self-clean function that elongates its life span. It prevents loose minerals from depositing inside the tank thus adding to the life and performance of this iron. 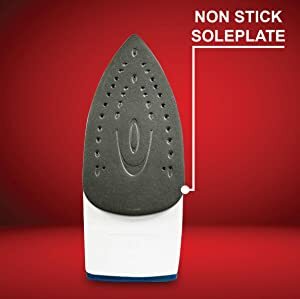 The high quality PTFE non-stick coated sole plate of the iron ensures that the delicate clothes do not stick to the plate. It therefore keeps your favourite clothes safe and make them last for years. The unique model provides easy access to difficult areas such as narrow edges, seems and collars.